The Ukrainian-born pianist Valentina Lisitsa has become even more famous than she's already been among the online community, after her political views cost her a job with a Canadian orchestra. And she doesn't plan on being silenced, she told RT. "I always separated music from politics and tried to keep enormous distance between the two," the pianist told RT's 'In the Now' host Anissa Naouai on Tuesday, after news of how she's been treated by Canada's Toronto Symphony Orchestra has spread globally. The hashtag #LetValentinaPlay surged in popularity on social media, and thousands of supporters spoke out for the artist, who was offered to be paid not to play. "I was about to play Rachmaninoff concertos with the orchestra, not to preach politics," Lisitsa, who was fired allegedly for her political views rather than lack of skill, told RT. The orchestra hasn't returned RT's requests to comment on the situation so far. "I never expected my music to be silenced," the pianist said, adding that she's "totally for freedom of speech, freedom of discussion and freedom of heated argument." "That's what I've been doing on Twitter," she said, explaining her extensive tweeting on Ukraine on the social platform, with her point of view not falling in line with the popular Western narrative, allegedly costing her a job. @ValLisitsa I'm born and raised in Canada and cannot beleive my country has sided with FASCISM! I am DEEPLY sorry. "I always thought that things like that could only happen somewhere in the countries known to be undemocratic," the ethnic Ukrainian, who has lived in the United States for 20 years and has both American and Ukrainian passports, said. "I tried to have a conversation with the Symphony through the management, but the only way they would talk to me is through their lawyer, [from whom] I got quite offensive letters," Lisitsa said, adding that those letters contained accusations of her having "come close to committing a crime by inciting hatred [by posting] inflammatory tweets." 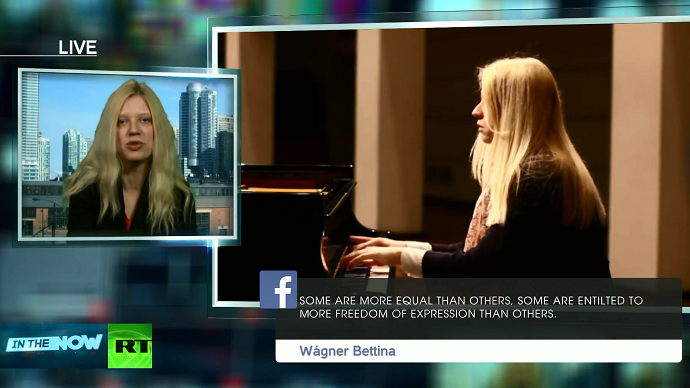 When asked about negative comments about her on social media – many of which were harsh and rude, calling Lisitsa a liar and telling her to "go to Putin" - she said such reaction made her laugh, as she's actually "never played in Russia." "It's laughable when people tell me to go back to Russia - I would love to go to Russia, I've actually visited it quite rarely and I'd like to catch up," she said, adding that "the world is much bigger" than some people imagine it to be, and the "Ukrainian community is so much bigger than the group of people who pressured Toronto Symphony anonymously to pay me not to play." "Looking backwards, I would not change anything I've done," Lisitsa told RT, saying she has fans around the world, not just in US and Canada, and has plenty of "places to go and play." "Music in the end is always going to win over the war," she said.